Now in paperback, a “balanced, engrossing account” (Kirkus Reviews, starred review) of the Bay of Pigs Crisis drawing on long-hidden CIA documents and delivering the vivid truth of five pivotal days in April 1961. THE BRILLIANT DISASTER is a remarkably gripping account of America’s Bay of Pigs crisis, drawing on long-hidden CIA documents and delivering, as never before, the vivid truth—and consequences—of five pivotal days in April 1961. At the heart of the Bay of Pigs crisis stood President John F. Kennedy, and journalist Jim Rasenberger traces what Kennedy knew, thought, and said as events unfolded. He examines whether Kennedy was manipulated by the CIA into approving a plan that would ultimately involve the American military. He also draws compelling portraits of the other figures who played key roles in the drama: Fidel Castro, who shortly after achieving power visited New York City and was cheered by thousands (just months before the United States began plotting his demise); Dwight Eisenhower, who originally ordered the secret program, then later disavowed it; Allen Dulles, the CIA director who may have told Kennedy about the plan before he was elected president (or so Richard Nixon suspected); and Richard Bissell, the famously brilliant “deus ex machina” who ran the operation for the CIA—and took the blame when it failed. 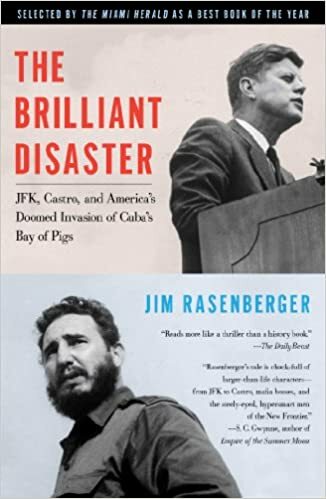 Beyond the short-term fallout, Rasenberger demonstrates, the Bay of Pigs gave rise to further and greater woes, including the Cuban Missile Crisis, the Vietnam War, and even, possibly, the assassination of John Kennedy.